Nickelodeon’s Splat Attack! Kickstarter Launching May 16th! 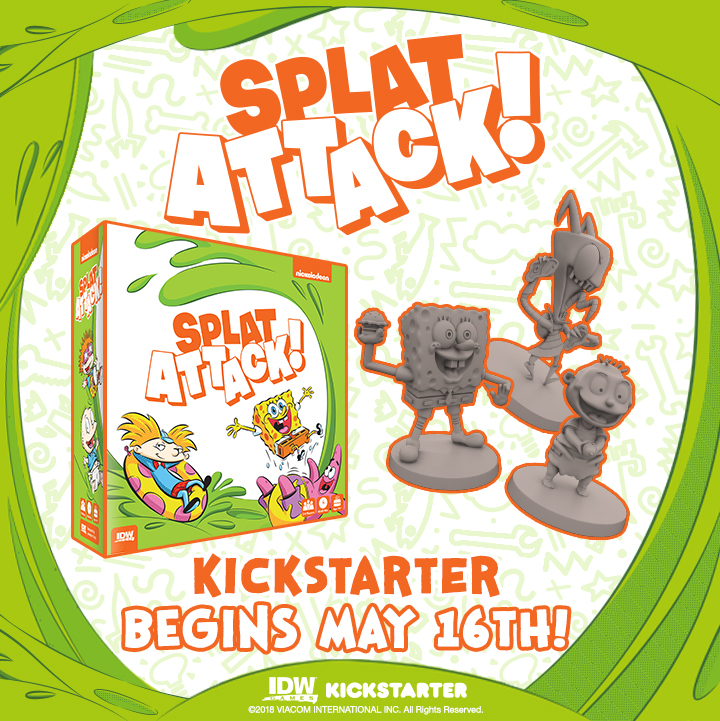 in Games Announcement, Kickstarter, Nickelodeon's Splat Attack! We are excited to announce the Kickstarter campaign for Nickelodeon’s Splat Attack! Featuring Rugrats, Invader Zim, SpongeBob SquarePants and Hey Arnold!, in an all-out food fight for control of the food court! Coming to Kickstarter on May 16th, this campaign brings your favorite Nickelodeon cartoon characters to the tabletop! Nickelodeon’s Splat Attack! is a 2-4 player game which puts players in control of teams from different brands as they fling food, fight for control of areas, use special abilities to come out the cleanest and avoid getting knocked out! The base game includes 16 highly detailed miniatures of your favorite characters and a whole plate filled with game components and card board elements. Designed by Jonathan Ying (Doom and Imperial Assault) this game is made for miniature games fans and new gamers. SpongeBob and Patrick taking on Tommy and Angelica for control of the food court is what this game is all about! What characters do you want to see in this epic food-fight miniatures game? Nickelodeon’s Splat Attack! will be coming to Kickstarter May 16th followed by a retail release in September 2018. ← Atari’s Missile Command Is Available Now!